It simply does NOT get any simpler or more frugal than a cucumber salad with dill in the heat of the August sun. The other day when the kids and I stopped by a roadside stand to buy some tomatoes, zucchini, and summer squash for our ratatouille, the farmer also had cucumbers listed at 6 for $1. And they were decent-sized...not too small and not so big that were tough and woody. So obviously I couldn't resist. Six into my satchel. And it bears mention that for these six cukes (of which I only used two here) plus the other veggies I brought home (of which only the tomatoes are entirely gone), I only paid a grand total of $3. Oh yeah, and he threw in a handful of fresh dill for free. There's a reason I look forward to this stand opening every summer! So as I surveyed my bounty spread out on the kitchen table upon returning home, I knew I had to find something to #CookforJulia that included cucumbers for my next endeavor. 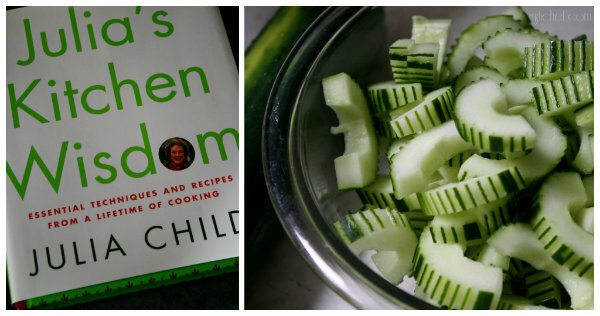 Fortunately, of the three cookbooks I have left to cook from, two contained cucumber recipes. And the third is Baking with Julia...so I baked a loaf of bread today, as well - that's coming up in the next day or so. And I suppose I'm really stretching it when I say "cook" with Julia. It falls more into the category of #AssembleSomethingForJulia, but hey. Nothing wrong with the quickies! Most people make some version of this cooling summer salad. And in my book, the more vinegar the better. I also choose to cut my cukes in thicker chunks than some, just because I DO add so much vinegar that I like them to hold up. You could peel your cucumbers, if you like. I like to leave mine on, especially if I know where they were grown. To make these fun, I just ran a zester (the kind with the holey things side-by-side) down the cucumber in an uneven fashion. I'd like to say it's simply because the kids love it that way...but honestly, so do I.
Peel the cucumber, if you wish. Cut in half lengthwise and scoop out the seeds (or leave them in...again, up to you). Cut into thin (or thick) slices and toss with salt, sugar, and vinegar. Let steep for 15-20 minutes (or longer) and then drain (or don't). Toss with as much chopped fresh dill as you like. Enjoy! Uh...yeah. It's just that simple. Adjust anything and everything from amounts to times according to your tastes. Eat as a side dish, a garnish, or a salad. You can find similar ones on Amazon (average price of $5). There is nothing better than a cool simple salad like this. Those cukes are gorgeous and a heckuva deal too! Hey, there's nothing wrong with assembling something for Julia--especially when it's a tasty little quick pickled cucumber concoction like this! My mom used to make a salad a lot like this one, actually. Love it! My boyfriends loves cucumbers and I...well...don't. But maybe I could learn to with this salad! 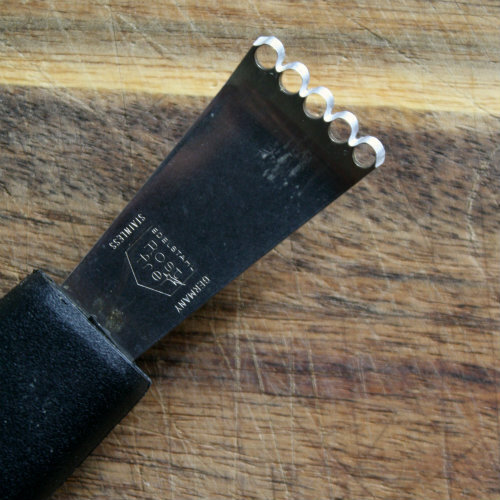 Now you have to show us what kind of peeler you have used to make them so pretty! 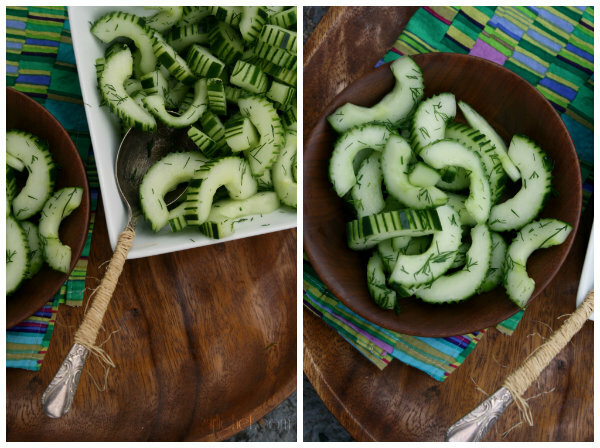 A simple cucumber salad is a great side to so many meals. I like it as an alternative to a side salad. Great recipe and you made it so pretty! I'm surprised this is a Julia recipe, my mom had these on the table everyday all Summer long. Reminds me of my childhood. Love that peeling job. So pretty. Nice and simple. Looks great cut this way! Here's a shot of the peeler/zester I used! So simple and so lovely. Also one of my favorite summer sides to just throw together. This is exactly like the cucumber salad I grew up on and still love it till this day....except I slice cucumber very thin. I will try it thicker. Your looks gorgeous! this really is the perfect summer salad. so clean and fresh, very nice! A simple recipe but oh so good! Looks good with the skin zested like that. I plead ignorance. I don't actually know this cookbook by Julia Child. I love that is about technique, because I aways change the recipes. Thanks for sharing your cukes on foodie friday. This sounds like a cool, refreshing summer recipe! Thanks for sharing on Foodie Friends Friday! Ha ha, I looked at this and said to Alexis "Look, she forgot the Greek yogurt in her tzatziki sauce." Great presentation on the cuke peeling! 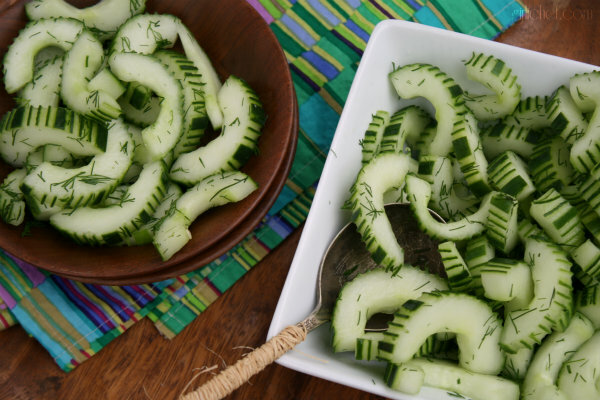 love the cucumber look of your salad! we have so many cucumbers on our garden, but they are so yummy, no one gets tired of eating them...and we eat them every night. i will try the fancy slices tonight! thanks! !